Our search for the best Cape Cod lobster roll has ended. There are many establishments serving good lobster rolls on the Cape, ranging from exclusive resorts with 5 star dining to tiny fish markets, the size of your garden shed. The one thing that the best Cape Cod lobster roll all have in common is…Loads of fresh lobster tossed with a little mayo…Period! No fillers…No celery…No onion…Fresh lobster, mayo, and a fresh roll. Our goal is to guide you to the Cape’s best lobster roll regardless of where it is served. 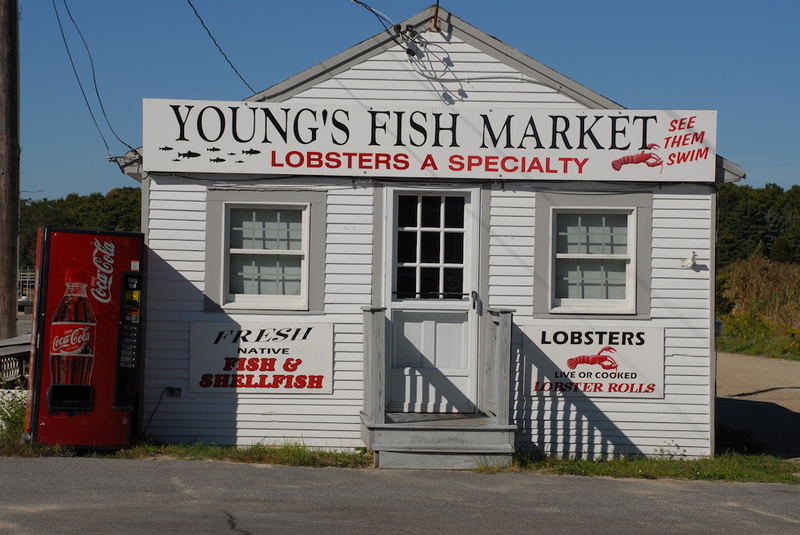 Young’s Fish Market is a tiny place right on the docks at Rock Harbor. The lobster rolls are loaded with fresh lobster meat tossed with a little mayo and served on a hot dog roll…And that’s it…Period…Perfect! They are only served to go. If you are looking for a place to enjoy the Cape’s best lobster roll, walk down to the end of Rock harbor. There are benches on the edge of the beach, or you can sit on the sea wall and enjoy! For a special treat, coordinate your lobster roll feast with sunset. Rock Harbor features one of the best sunsets on the Cape. Our family has been known to travel miles out of our way to get these lobster rolls for the beach. Wash them down with an icy cold Corona…Ahh, Cape Cod at it’s best! There are two other places that we feel deserve special mention, as their lobster rolls were really exceptional. The Raw Bar has a great lobster roll. The atmosphere is more “bar” than “seafood shack”, with a Caribbean feel. The lobster roll features heaping portions of fresh lobster meat, tossed with a little mayo…Just the way we like them! Wash it down with a rum punch…You won’t be disappointed! The Friendly Fisherman is a fish market known for its incredibly fresh, local seafood. It is located in a little strip plaza, and is easy to miss…But if you are looking for a great lobster roll, make sure you don’t miss it! Those are our choices for the best Cape Cod lobster roll. We hope that you enjoy them as much as we do. If you don’t agree, or you have something to add, please fill out the comments section and let us know! Click here to join the conversation and leave your comments for the best Cape Cod Lobster roll! by: Anonymous 8 oz. of lobster meat. Huge chunks. Toasted brioche roll. Comes with fries and slaw. South Yarmouth, MA across from the beach. by: Katherine I agree with the poster below that says the Sesuit Harbor Cafe’s lobster rolls are SSSSOOOOOOO overated. Just small bit of lobster compared to many and if you arrive when the line is long the start to pass out the lobster even more sparingly. Pass on Seusuit Harbor and head to Raw Bar if you are looking for volume or if price point is your thing go the Youngs – ENJOY! by: Marion Absolutely delicious ! The perfect lobster roll. by: Paul the friendly fisherman USED to be the best, however the staff became nasty & the rolls were not that great anymore ! Youngs is fantastic but you might want to have a “roll” from Georges fish market in Harwich Port. they are Fantastic ! you Decide. ! also Marions ( pie shop ) isnt that bad either. by: Sharon The Lobster Pot in wareham has the best cape cod lobster roll. Loaded with fresh chunks of lobster meat. by: Anonymous A true lobster roll is simply lobster and mayonnaise. It doesn’t need all of the fillers to mask the flavor. Places add fillers to mask the lack of freshness and the amount of lobster you are receiving. Fabulous Lobster Roll & More! by: Karen in CT Deb’s Veggie Depot has it all! Delicious and huge lobster roll made with butter or mayo, you decide. So much fresh, big pieces of lobster it falls out of the roll! The smoked ribs and pulled pork sandwiches are also the BEST!! I will be a customer for life and have recommended Deb’s to everyone! We all love you! Great customer service! Have to keep coming back because its soooooooooo good! by: New York Ed I think the basic idea of this page is really very good hence the rating. However, let’s talk lobster rolls.Staying in Hyannis for a few days I really wanted to try one of these things. So after reading all the reviews, I did a search for the address of the Beach Plum, which was a little confusing to find. I thought the Beach Plum was in Cape Cod, but I learned it’s actually in Rhode Island. Ok, no big deal, move on to option two; The Raw Bar.Even though there’s a Raw Bar right across the street from my hotel, I decided to take a ride into Mashpee and visit the Raw Bar there.First let’s talk about the service. There is no way anyone can say the staff are friendly. On the other hand they’re not unfriendly. It’s more like they have no personality at all. Further, it seems that the cook is just waiting for someone to use their cell phone which, according to the many signs, is prohibited in the Raw Bar (including texting) so that he can more or less shout “NO CELL PHONES HERE!”.I’m not a big cell phone fan either, but I don’t expect to be embarrassed in a bar & grill because I didn’t see some silly sign. So, onto the lobster roll. I had nothing to compare this to as it was my first one, but the portion was quite large and it did need to be started with a fork before trying to pick it up. The cook didn’t go overboard with mayonnaise, nor was there any celery or lettuce (or any seasoning at all). I found this sandwich to be extremely bland with virtually no taste other than the mayonnaise. In fact it seemed that the mayonnaise completely masked the taste of the lobster. Personally, I don’t get the big attraction and if this place serves one of the best, then I can honestly say I will probably never order another. To each his own; I just didn’t really care for it at all. by: Rick LOBSTER POT in East Wareham MA…. by: Anonymous I went to the LOBSTER POT in Wareham today and I thought the lobster roll was PERFECT. Just the way it should be made. Not only the lobster roll, but everything about the place. Clean, great fast service, all fresh made food cooked to order. Very impressed. by: Grampas Antique Kitchen I am very critical when it come to food. I am also very frugal/cheap with my money. So I want very good at cost effective prices. I have not tried ever place mentioned in other’s reviews, but i will! I go out of my way to stop at either the Raw Bar in Mashpee at $25 for this gigantic Lobster roll or at The Beach Plum in N’Hampton, NY on route 1 for their nearly as large roll for $17. Now I live over 100 miles from either place. We take motorcycle rides to both places just to get the Rolls. If on business within 25 miles of either, I’ll go as well. I bought one at Beach Plum for $17 and another on my out of town at a fish market for $10. I could make 3 to 4 out of the Beach plums Lobster roll like the one for $10 at the fish market. One could easily make 5 regular $10 lobster rolls at most places out of the Gigantic one from the Raw Bar. Yes its messy if you try to pick it up to eat it. Too bad you are forced to eat at least half of the meat with a fork befor you can attempt to pick it up as a sandwich. Some people will complain about anything! by: Anonymous We just completed a three day tour of the regions Lobstah Roll providers and have noted that the lads of Young’s…do whip up a “cost effective” lobstah roll…..$9.50 is nice….no fillers….If one goes right next door to those……women….at Cap’t Cass….you will finda lobstah roll at twice the price (with added sides of fries and c-slaw) A bit more lobstah meat…….but still at twice the price…..Advantage………… Young’s. Now talk some trash guys! Amazing Lobster roll! Stuffed to the brim with a ton of lobster pieces and a tad of mayo – comes with fries and a pickle for $15. I don’t know how they can afford to cram this much proper Lobster in every roll, every time! Enjoy!!! by: JZ Have eaten at all of the places listed and some are good, some are just so so, but to be honest go for the hidden jewel at Liam Maguires in Falmouth. Not as big as Raw Bar, but oh so much better. I almost dont want to mention it as it is busy enough there. Lightly toasted and buttered roll and loads and loads of claw and tail meat with just a bit of mayo. Its absulutely perfect and no attitude to boot! by: Anonymous Cape and Wareham, BEST LOBSTER ROLL.Just got back from trying 5 different lobster roll places. Arnold’s WAS THE BEST.On RTE 6 in Eastham, just a little bit past the Friendly Fishermasn.–full tasty roll, and huge servings of good Onion rings, fried clams and fries too. Clean and efficient. So, Arnolds=#1. Friendly Fisherman= skimpy # 2 ; Lobster Pot in Wareham = # 3. Captain Frosty in Dennis not good / no comparison. If you live off Cape near Framingham go to Kelly’s Roast Beef–they have better Lobster rolls than any we had on the Cape. The original Kelly’s is in Revere Beach and a few other new Kelly’s are popping up. HUGE Pieces of DELICIOUS lobster meat–not mashed up/diced up stuff! by: UncleB Stopped by this weekend to try Young’s and they did not disappoint. Nice portion size and a great price…$9.50!!!!. I’d like to try it on a grilled bun just to see if that would give it a little something. However, the meat was great and I’d go back for another in a heartbeat. by: Kelly Just saw some reviews on TV on the best lobster rolls in New England. The # 1 was the Beach Plum in North Hampton. So we went. WOW they weren’t kidding. $16.95 for a slightly grilled mounded lobster roll. Worth every penny. Tastey and loaded . Awesome !!! Then 2 days later on the way back home, tried the #3 which was the Lobster Pot in Wareham. No comparison at ALL !!! For $13.50 I probably got 3 or 4 oz of lobster on lettuce ( which only purpose is to take up space) Too much mayo. What a poor excuse for a lobster roll. Called the manager on the way home about it and he didn’t think that was wrong. Anyway, we have been to the Raw Bar years ago and they give a great lobster roll. I’ll need to go soon to update my tastebuds.I only wish I had taken a photo of the 2 lobster rolls so that I could show the Lobster Pot what a real lobster roll looks like. I told him to try the Beach Plum so he could see the difference. His answer was that The Beach Plums cost more. DUH !!! But for the 3.50 more you get that much more. I then called the Beach Plum and gave them KUDOS for serving the BEST !!! by: Chef Mel The Friendly Fisherman.. by far the best Cape Cod lobster roll I have had, just perfect and HUGE!! Stop by and try theirs…never be afraid to try the “other guys”! by: LOBSTER LOVER I found the best Cape Cod lobster roll!The LOBSTER POT Cranberry Highway, Buzzards Bay,on the Wareham line has the best lobster rolls. They use fresh chunks of lobster meat,add a little mayo (NO CELERY),and place it on a toasted hot dog roll with a little lettuce. So simple, but sooo…good ! The fresh taste explodes in your mouth. I mean it! It unbelievable, the flavor of fresh lobster, my favorite food. The difference is they steam their lobsters(not boiled), so the lobster flavor isn’t washed away into the water, it stays in the lobster meat. That must be why it is so good. Well, one thing I can say, it’s been a lot of fun looking for the best lobster roll, but even more fun eating them. Sesuit – No!, Raw Bar – Yes! by: John Whoever said that the lobster roll at the Sesuit Café in Dennis was the best Cape Cod lobster roll obviously has low standards. We traveled to this out-of-the-way place based on a recommendation on this site and we were very disappointed with what we received. When the food arrived at our table, there were two slices of tomato and a piece of lettuce in the roll. I don’t like that in my roll as it just takes up more room that could be used for more lobster meat. A small pile of lobster meat was on one end of the roll and it looked like they used a small ice cream scoop to place it there. Even when I spread it over the rest of the roll, I would bet that I would get just as much meat in a lobster roll at MacDonald’s. Definitely not worth the effort or money to go to this place!You want the best lobster roll on the Cape? Go to the Raw Bar in Mashpee. The lobster meat (100% meat, no fillers) is piled up so high on the roll that they give you a fork so you can eat enough to be able to pick up the roll and eat the rest of it. Those people with an average appetite can’t finish the roll and often take the half of the roll home. Good drinks, friendly staff, and pleasant surroundings make this a definite place to visit again and again! by: Kevin C. As a resident of Cape Cod my entire life (61yrs), the Lobster Roll has always been a number one choice of mine. Over the years I have ordered Lobster Rolls in hundreds of establishments. Without question, the top two Lobster Rolls can be found at the Raw Bar in Mashpee,and the Beach Plum in North Hampton. These two establishments far outshine everyone else. Lobster, atouch of mayo, nothing else on the roll. Beach Plum was voted # 1 Lobster Roll at the Hampton Beach Seafood Festival last summer. I’m so hungry typing this, I think I will head down to the Beach Plum today. Having returned for a few days from the Cape,having Lobster Rolls from both places in the same week will be a first. It can’t get any better! Kevin C.
only $13 bucks! it’s definitely the best. by: shawn Has anyone tried sesuit cafe? Its a big boat yard located off of historic 6a believe its Dennis over looking Nantucket sound. After driving through a very nice and elegant section you come upon a marina right next to Cold storage beach. My first impression of the place was a little shack then I stepped out of my vehicle and saw a million dollar view to die for. We ordered lobster roll plates and I couldn’t even see the hot dog roll it was loaded with huge chunks of fresh lobster. After eating your lobster roll you can walk 10 feet to the beach and watch the yachts and charter boats chug on by. Reccomend you go around sun-set and I gaurantee you will not be dissapointed. Then if you have room head to Sunday school for dessert ohhh I love the Cape. Absoulte BEST lobster roll on the Cape!! by: Cape Cod Nana Having worked in Cape restaurants for 35 years and KNOWING a good lobster roll, there is no doubt in my mind who has the best one. It is, hands down, the Raw Bar at Pomponesett in New Seabury. YOU WILL NOT FIND BETTER! Untoasted roll( never toast a lobster roll, as it detracts from the taste of the lobster) with just a hint of mayo…..that’s it! Why would anyone ruin the delicate taste of lobster with celery, gobs of mayo, spices, etc.?? Second best? The Chart Room’s lobster sandwich on portuguese bread. It is very good, but not as good as the Raw Bar’s. Now go try it…..and no cell phones! Steve (owner) will not allow them, so turn them off. Enjoy!! has the best lobster roll. It is by far the best I ever had. Not only the best in the cape area, but the best in New England. Liam Maguires has the best Cape Cod lobster roll!! by: Love seafood!! We visit the cape cod area every year. I absolutley love lobster. We went to almost every resturant and seafood “shack” to try their lobster roll and chowder. After a long week and a lot of calories we stopped by liam maguires for a bite after shopping. We couldn’t believe our eyes when we saw the guy next to us with a HUGE lobster roll so I just had to try it. It was the BEST lobster roll I have ever had. It had enough meat for 3 lobster rolls!!! We were so happy with all of their food and service we go back every year. You must try it it is incredible!!! by: Anonymous Sorry for being a contrarian here but The Raw Bar at Poppy does NOT have the best lobster roll on the Cape. That is, unless you love your lobster frozen out of a can. For the best FRESH lobster roll on the Cape go to The Friendly Fisherman in Eastham. Ya Gota Go To Moe’s !!!! by: Rob Nichols The best are at Maurices Campground located in Wellfleet right accross from the Drive In theatre. Best price and more meat for the buck. The Store is open from late May till to Early September…..Go see Big Moe ! by: kathy Poppy does have the best Cape Cod lobster roll but.. try the lobster roll cruise in Dennis. You get the cruise and a lobster roll too!!!!!!!!!!!! by: John Our search for the best Cape Cod lobster roll led us to the Popponesset Inn at New Seabury. We had been told “You have to try the lobster roll at the Poppy”. As we followed the meandering road through New Seabury, we could tell we were in for something special. The community is beautiful. Its streets lined with luxurious homes seemingly tucked neatly into each lot.We arrived at the Popponessett Inn and made our way into the bar, where a table on the patio beckoned. The stage was set. From my vantage point, I could see two televisions, both playing the final round of the British Open, and gorgeous views of Vineyard Sound. As the light breeze cooled the sea air, I knew that it didn’t get any better than this.We ordered two Grey Goose seabreezes and two lobster rolls, and waited with giddy anticipation. When the lobster rolls arrived, we were floored by the amount of lobster meat. The roll was literally overflowing with large pieces of tail and claw meat. There must have been two lobsters in each roll with just a slight amount of mayonnaise. Perfect!If you are looking for the best Cape Cod lobster roll, don’t miss the “Poppy”. 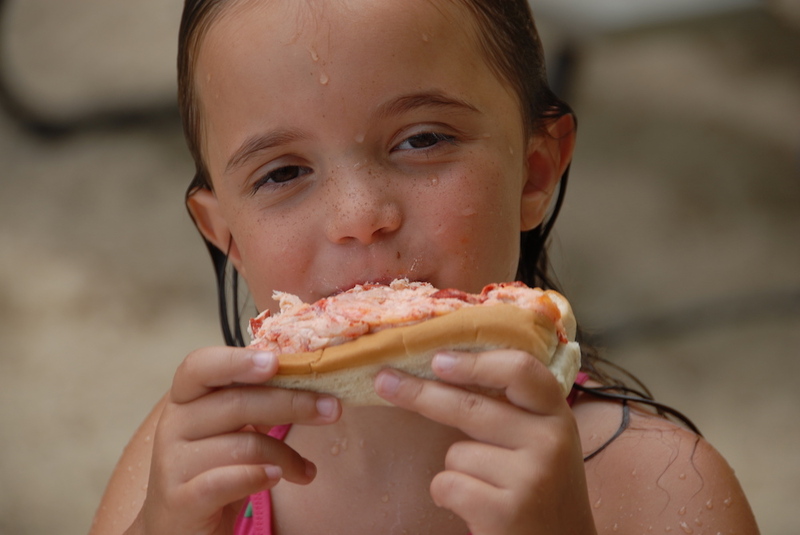 There is no doubt, the Popponessett Inn has the best lobster roll on Cape cod! Okay the Chart Room in Cataumet. Overlooking the water, this is out of the way, and you would never find it if you don’t ask. The lobster roll is up to $30 now but it the best lobster roll and the hugest lobster roll…I can only eat half…so it’s like a two meal deal for me. Anyway, they serve it on the most exquisite Portugese bread or in a tomato… yep. I’ve never actually tried the tomato. I can’t turn down the delicious Portugese bread. It also comes with as small side…I get the potato salad. It’s not commercial stuff. It’s house potato salad. I dont even like potato salad bug I eat every tiny bit. I have a photo that would blow your mind but I dont see a place to upload it…too bad. By the way, I was there, several years ago, when Dizzy Gillespie asked to speak to the chef. He wanted to say it was one of the best neal’s he ever had. Wow !!! Just go….get the lobster roll, watch the sunset…and enjoy! !